Warning! This box contains top-secret plans, codes and gadgets. It must not fall into the wrong hands. Only YOU have been entrusted with its secrets. Only YOU have permission to look inside. 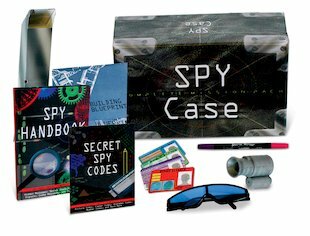 All the spying secrets and cunning codes in here are strictly for your eyes only – while an invisible ink pen makes sure your messages stay that way! But with a fake ID and sunglasses for cool disguises and a night-vision gadget for every stake-out, who would ever track you down? Box contains a 32-page spy handbook, secret codes book, periscope, mirrors, magnifying sheet, invisible ink pen, sunglasses, ID card and night-vision gadget. I’m getting mine at school that is ashfield junior school and it looks awesome.